A version of this interview originally appeared in The Practicing Writer, May 2008. Stephanie Elizondo Griest is another practicing writer I've come to know courtesy of e-mail. When she was awarded a residency at the Kimmel Harding Nelson Center for the Arts last year, Stephanie contacted me, a past KHN resident, with a few questions about my experience there. But it soon became clear to me that as much as I've learned about residency programs in my life as a practicing writer, Stephanie knows much more! So I asked her if she'd share with all of us some of her insights and advice. First, a bit about our author: Stephanie has mingled with the Russian Mafiya, polished Chinese propaganda, and belly danced with Cuban rumba queens. These adventures inspired her award-winning memoir Around the Bloc: My Life in Moscow, Beijing, and Havana (Villard/Random House, 2004) and guidebook 100 Places Every Woman Should Go (Travelers' Tales, 2007). 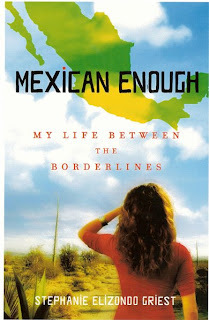 Atria/Simon & Schuster will publish her memoir Mexican Enough: My Life Between the Borderlines in 2008. She has also written for the New York Times, Washington Post, Latina Magazine, and the Associated Press. A 2005-2006 Hodder Fellow at Princeton University, she lectures and performs nationwide, and recently won the Richard J. Margolis Award for social justice reporting (editor's note: this award includes a one-month stay at the Blue Mountain Center--another residency experience). Visit Stephanie's Web site at www.aroundthebloc.com. ERIKA DREIFUS: Stephanie, you're obviously an intrepid traveler. When did residencies start to become part of your travels? Where were you in terms of your writing and publishing history? STEPHANIE ELIZONDO GRIEST: I learned about the magical world of residencies just a few months shy of the deadline for my first book, Around the Bloc. I was struggling in New York at the time, sharing a small apartment with multiple roommates and working a full-time job. I desperately needed time and space to finish my book, so I applied to two colonies and got accepted at Ragdale. I very nearly turned it down, though, because of the cost. Not only would I have to buy a plane ticket to Chicago, but Ragdale also charges a daily fee. Fortunately, they offer financial aid in extreme cases, and when I sent in my microscopic W-2 form, they awarded me one in a jiffy. I'll never forget my first glimpse of Ragdale. It just radiated good vibes. I could feel it from inside the taxi. And by the time I entered my beautiful cloister, with its fireplace and screened-in porch and clawfoot tub, I was radiating, too -- from happiness. Some of the best writing in my book occurred during those two weeks at Ragdale. The solitude enabled me to see the holes in my text and how best to fill them. Ragdale is also where I started referring to myself as a writer for the first time -- and believing it. ED: Your residency record includes an array of sojourns: Ragdale, Art Omi International (Ledig House), the Writers' Colony at Dairy Hollow, and the Kimmel Harding Nelson Center for the Arts. You've also spent a year as a Hodder Fellow at Princeton University. Tell us how you have discovered these opportunities. Which resources (besides, of course, The Practicing Writer!) do you turn to when you're looking for residency possibilities? SEG: For domestic residencies, I refer to the wonderful Web site of the Alliance of Artists Communities, at www.artistcommunities.org. For international residencies, I scour the archives of ResArtis, at www.resartis.org. Whenever I arrive at a new residency, I quiz everyone about their favorite spots. Those of us who hop around from colony to colony are known as "colony whores," and we like to compare notes! ED: What qualities/characteristics do you look for in a residency program? SEG: Every residency is glorious in its own special way, but because I operate on an extremely tight budget, I strive for programs that are either free of charge or that offer scholarships (or better yet, stipends!). Communal meals are also a priority, because the food is invariably home-cooked and delicious, and it is great fun to chat with the other residents. So that's my criteria: no fees and free food. ED: What practical advice would you give writers facing their first residency application(s)? SEG: It is like applying to college. There are "long-shot" residencies, such as Yaddo and MacDowell, which can be as selective as the Ivy League. Other residencies, like Virginia Center for the Creative Arts and Vermont Studio Center, are more welcoming to newer writers. My advice is to apply for as many as your time and budget will allow, targeting both the "long-shots" and "sure things." Generally speaking, residencies that are free and located in the Northeast or West Coast are more competitive than residencies with daily fees located elsewhere in the United States. Apply to a good mix. And be sure to give your references plenty of time to write their letters, and send them a thank-you note/gift afterward (because before you know it, you'll need another letter). ED: Once a writer receives an acceptance/invitation to a residency program, how should s/he proceed? From your own experience, how can one best prepare for a residency? SEG: Be open to the muses. I've seen writers arrive to residencies with the intention of slaving over a book of short stories, but instead they commence a memoir. Others are serious non-fiction types, but after a few days of wandering around the neighboring forest, they start composing poetry. You never know what will happen to you at a residency. While it is helpful to arrive with a project in mind, allow yourself to be smitten by the unexpected, and to follow it. ED: I understand that you'll be leaving shortly for a residency at Can Serrat in Spain. Tell us what has drawn you to that particular residency program, and what you plan to be working on while you're there. SEG: What drew me to Can Serrat? Location, location, location! They are nestled inside a rustic farmhouse in Monserrat Natural Park, about an hour's drive from Barcelona, within walking distance of a monastery with a 1,200-year history. While there, I hope to complete a proposal for my next book and write an essay about my recent trip to Mozambique. But we'll see what the muses have in store! ED: How do you expect to organize your time at Can Serrat? Based on your experience, how would you advise writers to make the most of the time they're given at residencies? SEG: I am rather masochistic at residencies. As soon as my eyes open (generally between 8 - 9 a.m.), I wash my face, brush my teeth, plunk down at the desk, and stare at the computer screen until I am literally passing out from hunger (generally between 12 - 2 p.m.). Then I cook some oatmeal, go for a bike ride, check email, and -- if I can stand it -- write another hour or two. If I don't drink too much wine at dinner, I usually edit the day's work afterward, then read until my eyelids droop. ED: How have your previous residencies enhanced your writing? SEG: The sad truth about book writing is that unless you're churning out best-sellers, you barely get paid enough to subsist. So my books (and career) would not exist without residencies. Around the Bloc became an entirely different creation during my two-week residency at Ragdale. While at Princeton, I wrote all of 100 Places Every Woman Should Go and sold my proposal for Mexican Enough. And I wrote every word of Mexican Enough at Art Omi, Kimmel Harding Nelson Center, Dairy Hollow, and a silent Catholic retreat in South Texas called Lebh Shomea. Residencies allow me to maintain my gypsy writer lifestyle, rent-free. ED: Any residency programs you haven't yet attended but would like to? What appeals to you about them? ED: Anything else you'd like to share with us? SEG: Even if you have an ideal working situation at home (i.e. no roommates/spouses/children/pets), you will still be far more productive at a residency. There is something quite profound about creating art in a space where only art is created. Muses seep into the woodwork. You feel compelled to rise and write in the morning. You grow inspired by the writers and artists sitting across the dinner table from you. And because the staff takes care of all the cooking and the cleaning and the purchasing of toilet paper, you get to do things time never allows at home, like taking long walks through silent woods and catching up your journal. Give yourself this gift of time and space, at least once in your career. I promise it will be sheer bliss. And let me know how it goes! I'll be touring the nation this fall, promoting my memoir Mexican Enough. It would be beautiful to see you. Or drop me a line via my Web site, www.aroundthebloc.com. Saludos! NB: You can find an excerpt from Stephanie's new memoir in the current issue of World Literature Today. So much great information, Erika. Thanks for doing this. Thanks so much for your comment, Lisa. I really had a good feeling about Stephanie's expertise on this, so I'm glad you agree!